To Heire on the "Ships starting with H" page. Delivered in June-1917 from Pusnes Støberi & mek. Verksted, Arendal (38) as Stend to Laur. Christiansens Rederi, Bergen, but sold to Skibs-A/S Nordsjø- & Baltic Linje (Jervell & Co. A/S), Ålesund upon delivery. "Våre gamle skip" by Leif M. Bjørkelund & E. H. Kongshavn gives tonnages as 896 gt, 456 net, 1250 tdwt, 210.5' x 33.2' x 13.3', Triple exp. 115 nhp (Pusnes MV). In Nov.-1917 she was sold to A/S Borch (A. F. Borch & Sønner A/S), Drammen. Sold in Nov.-1924 to D/S A/S Heitmanns Rederi (H. Heitmann & Søn), Oslo and renamed Heire. Follow the convoy links provided for more information on each (some listings are incomplete). Where the "Convoy" column is left blank it means that convoy is not known. Please be aware that errors may exist, and this could also mean that she may not have sailed in all the convoys mentioned here. Also, as can be seen, the record is incomplete. *Page 1 gives departure Oct. 28. Page 2, Page 3, Page 4, Page 5 & Page 6. Most of these 1944 voyages are not detailed on the archive documents (Page 13, Page 14 & Page 15) and, therefore, comparison cannot be made and accuracy confirmed. *Convoy EBC 88 (external link) did start out from Barry on Aug. 30-1944, but according to Page 14, Heire sailed from Plymouth on Aug. 31; the Aug. 30/Barry entry should probably be ignored. *Not sure which of the above 2 entries is correct, as this voyage is not detailed on the archive document; my guess is that the first one should be ignored. (Also, please compare the rest of Hague's entries with the archive documents). *Page 15 gives arrival Cardiff Jan. 6, left for Plymouth Jan. 10. Jan. 12 Plymouth Plymouth Jan. 12 COC 48 Put back. In Apr.-1940, Heire was in Convoy HN 24, which arrived Methil from Norway on Apr. 7-1940; in other words, she got out of Norway just before the German invasion (Apr. 9). The Norwegian Bjerka, Cresco, Fagerbro, Iris, Marita, Stadion II, Varegg, Vigør, Royal, Raftsund and Lysaker IV are also listed in this convoy. Heire was bound for Liverpool, where she arrived on Apr. 10, having sailed from Bergen on Apr. 3. According to Page 1 of the archive documents, she later made some voyages to France. In Aug.-1940 she's listed, together with Lom, Solitaire and Svint, in Convoy OA 204, which left Methil on Aug. 25 and dispersed on the 29th - ref. external link provided within the table above. No destination is given for Heire, but it looks like she was bound for Dublin at the time - again, see the archive document mentioned above. 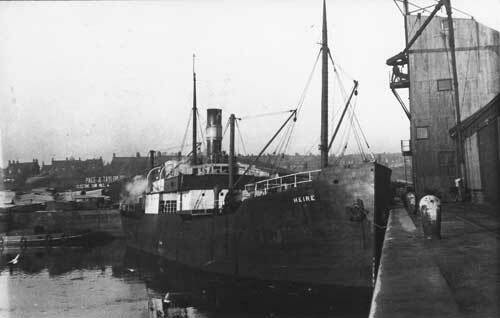 A little snippet from "Nortraships flåte"; Heire lost her propeller in Febr.-1941 and was towed to Blyth. Her 1941 voyages start on Page 2, which says she arrived Falmouth in tow of a tug on Febr. 3, having sailed from Dartmouth on Jan. 31. Her 1941 voyages continue on Page 3, Page 4, Page 5 and Page 6. The latter document also has her early 1942 voyages, while others are listed on Page 7, Page 8, Page 9 and Page 10. 1943 voyages start on Page 10, and the rest are shown on Page 11, Page 12 and Page 13. 1944 voyages also start on Page 13. She took part in Operation Neptune, the maritime side of the invasion of Normandy in June-1944, arriving Omaha Beach on June 12, departing June 19, according to "Nortraships flåte". Page 14 and Page 15 list more 1944 voyages; Page 15 also has some early 1945 voyages, while the rest can be found on Page 16, Page 17 and Page 18. Sold in 1949 to D/S A/S Svanholm (Trygve Matland), Haugesund and renamed Svanholm. Modernized in 1951, in North Sea service and seasonal lumber trade. Sold in Aug.-1960 to Finnish owners and sailed as Svanholm for Gösta Sigfred Lindström, Borgå, then from 1963 as Panamanian Bamby (South Star Corp. Panama). Arrived Gijon, Spain on Aug.-17-1965 (1967?) for breaking up. Back to Heire on the "Ships starting with H" page. The text on this page was compiled with the help of: "Nortraships flåte", J. R. Hegland, "Våre gamle skip", Leif M. Bjørkelund & E. H. Kongshavn, and misc. as named.